...in December 1984. 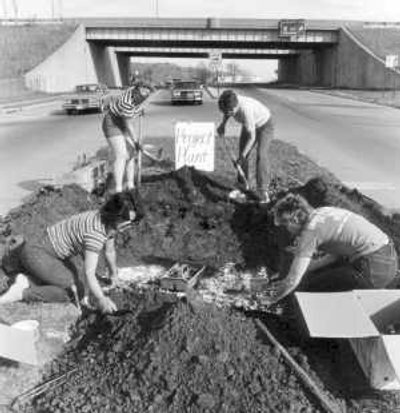 We celebrated getting our articles of incorporation, dated December 3, 1984, by planting a small cluster of red species tulips on the East State Street traffic island at the Rt. 33 entry. We broke the ground open with a pick, planted them with an extra dose of bone meal and strong doubts of survival. The tough little tulips not only made it, but they went on for years. So have we. Created to make the City more attractive for residents and for businesses, Project Plant has been cultivating Athens ever since. The first project, wrought-iron flower baskets designed by Athens High School Industrial Technology students, beautified Court Street for many years. Today Project Plant greets travelers and residents with City entry gardens. More gardens followed the first one on East State Street: Stimson Avenue at East State Street, Columbus Road at Route 33, two island gardens at the Richland Avenue/Route 682 entry, the Second Street/Lancaster Avenue corner, Madison Avenue at East State Street, and the Athens County Convention and Visitors' Center at Mansfield House. We also started many other City gardens that are now maintained by part-time City landscapers. The City installs the flower baskets on Washington Street in the center of town. ...just what are those plants on that historic East State traffic island garden? Our contractor, Christina Deshaies, of Thyme and Again Gardening, made this garden the hottest spot in town with flamboyant scarlet celesta 'New Look' flanking dwarf red canna lilies 'King numbed'' stands of feather salvia 'Hummingbird,' coleus 'Pineapple Crush,' hot pink geraniums, orange 'Dreamland' series zinnias, nastudium 'Straw- berries 'n' Cream,' verbena 'Homestead Purple' and black-eyed pusan vines. Lawrence Gingrich, Christina's father, crafted the wrought-iron trellis that graces the garden. 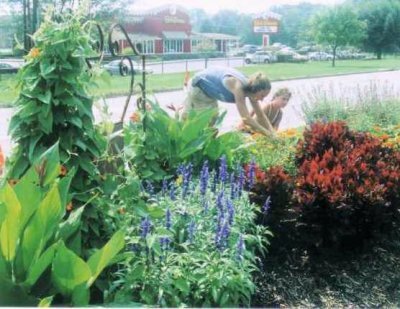 Lisa Agriesti, left, and Lori Linnevers tend the garden on the East State Street traffic island at the Rt. 33 entry to Athens. How Does Our Gardening Grow? The Athens County Convention and Visitors Bureau has supported us with tourism funds as has Athens City Council. In years past, we received grants from the Athens Foundation and the O'Bleness Foundation. But the most generous, most consistent funding for this delightful civic enterprise comes from the citizens of Athens City and County. Project Plant, P. O. Box 5676, Athens OH 45701.